Product prices and availability are accurate as of 2019-04-10 01:57:45 EDT and are subject to change. Any price and availability information displayed on http://www.amazon.com/ at the time of purchase will apply to the purchase of this product. 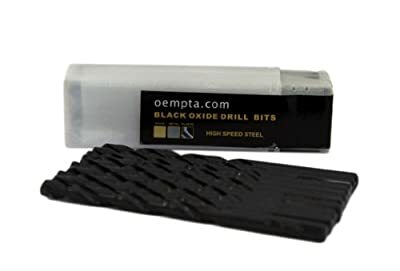 OEM Tools 1/8" x 2 3/4" OAL Black Oxide Jobber length drill bits that are designed for jobsite durability and extended life. Our web geometry has a thicker core than a standard drill bit, providing the user with maximum strength; helping eliminate side-load breakage. We added a unique parabolic flute that keeps the bit running cool. A standard 135 Split Point tip starts on contact; eliminating walking for fast accurate holes. Excellent for drilling on curved surfaces, requires less effort to drill and is highly recommended for use with portable drills. The Tri-Cut shank won't slip in the drill chuck. Bits above 3/8" diameter have a reduced shank diameter for use in 3/8" chucks.